How to check if your data was stolen by Cambridge Analytica? Facebook has decided to send notifications to all users (including roughly 87 million people) who had their data stolen by the disgraced political firm Cambridge Analytica. 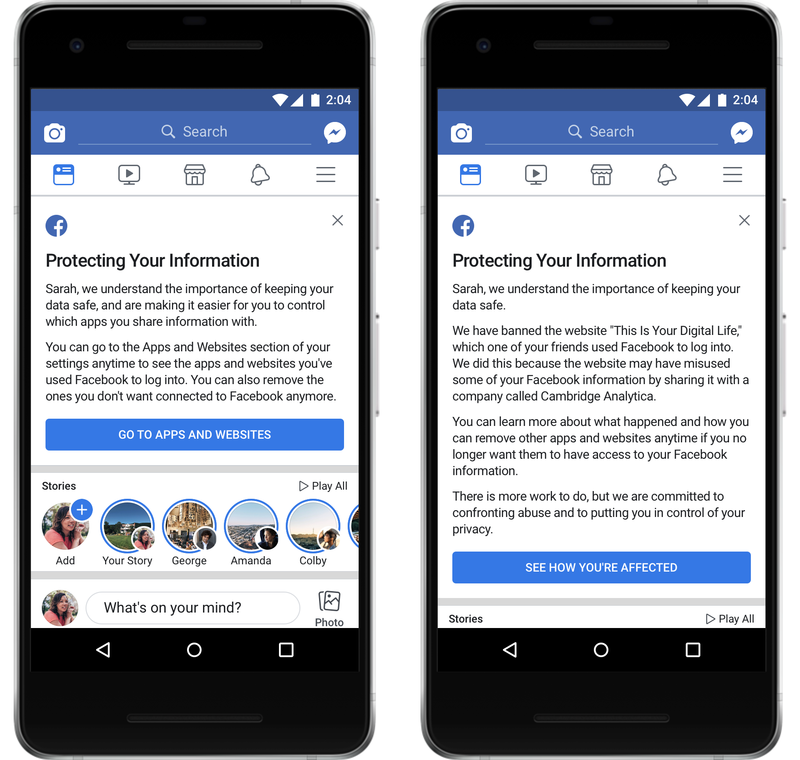 On Monday, users started receiving notification prompting them to review the apps and websites they use are linked to Facebook and what kind of information is shared with them. The alert also carries privacy setting button to withdraw permissions you may have previously given to an app or a website. If you receive a privacy setting notification, don’t freak out just yet without checking it out first. And even if your profile wasn’t hacked, it’s probably a good time to review your privacy settings. But if the alert confirms your data may have been compromised, it will guide you of the steps you need to take as well. Look at the following screen to know the difference between the two. If your data was not stolen by CA, the alert will look like the screen on the left and if your data has indeed been compromised, it will look like the one on the right. Since 70 million out of the roughly 87 million compromised accounts are of the US users and with over 2.2 billion registered users on Facebook, the odds are in your favour and you will most likely receive the notification as the one on the left. Facebook has also kicked out two apps that it suspected were abusing users data through their personality quizzes. They are CubeYou and Canadian analytics firm AggregateIQ prompting Canada to launch their own investigation. 3. Have a strong password that is not easy to predict or break — preferably a different password for each platform — and it should comprise on a combination of letters of both upper and lower cases, numbers and special characters. Make sure you don’t share your password with anyone, remember it instead of writing it anywhere and change it every now and then. 6. Double check what you’re saying yes to when accessing your accounts on a mobile device and before giving cross-platform authorisation. Many people unknowingly allow access to their phone/address books to third party apps without knowing what they will do with it.